Don't know what I love more about this blog - the professional quality photos, the "I have to go there!" destinations or the smart, very witty writing. A great place to find those "off the beaten path" activities in the UK and beyond. Megan is full of great travel stories and anecdotes and visits every country as a local, so you can too. Additionally, the quality of her suggestions is elevated by her policy of only writing about a place if she herself has visited. Definitely worth a read! I love the vivid photography and the humorous, yet informative style of writing. Really intertaining. I followed Megan on her old website and loved her there...and now followed her over here to her new, beautiful website. The photography is beautiful and her writing authentic and travels inspirational. Bookmarked! I love this blog. 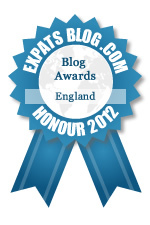 It has so many travel ideas for the expats in London. She just returned from my home town, Venice! The photos are so beautiful. She gives smart advice and good information. I'm so glad I found your blog. You've inspired me to pursue an overseas move and live the life of travel that I've thought about for years. Can't stop scrolling through all the possibilities.